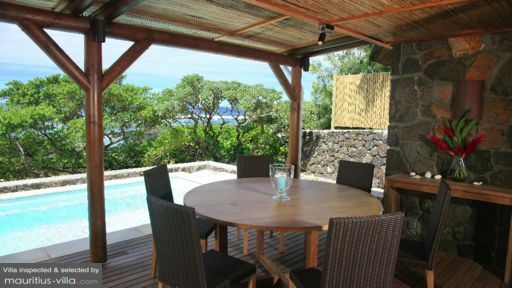 Villa Dunes 1 is a found on the east side of the island Mauritius. A peaceful area where you will feel enchanted by the azure blue ocean and the beautiful nature all around you. The capital city Port Louis is a 40 minute drive away and the beach resort town of Grand Baie 35 minutes. After a day of sightseeing, villa Palmiste is a great sanctuary of tranquillity to come home to. Following the stairs in the living, leads up to the air-conditioned master suite. An elegant wooden room beneath the villa's beautiful thatched rooftop. The room is furnished with a comfy double bed and a television for some entertainment before sleep. In the morning you will wake up to the view of the ocean. Behind the bed there is a private en-suite bathroom. There is also a TV room furnished with a single bed and on ground level there are two more air-conditioned bedrooms equipped with twin beds. These rooms share one bathroom together. The villa has two maids who do all the housekeeping for you. Day-trips, a car and driver or an in-villa chef can all be arranged for you upon request. With the ocean at your feet, Villa Dunes 1 is an idyllic holiday home to unwind together with your loved ones. The sunny pool-deck is where you will be spending lots of time, jumping in and out the private pool, sunbathing on the pool-side loungers and reading books on the breezy shaded veranda. Inside the villa is designed tastefully with natural stone walls and full length glass doors that allow natural sunlight to brighten up the living space. There is an L-shaped sofa tucked with blue pillows and a teak dining table with rattan chairs. The kitchen is fully equipped with everything your home away from home needs.